Located at the base of the Yucatan Peninsula, Belize offers travelers a wealth of attractions. The country's dense rain forest is dotted with Mayan ruins. 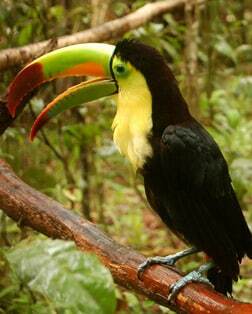 The forest is also home to a wide range of tropical wildlife, ranging from jaguars and ocelots to keel-boated macaws and howler monkeys. Offshore, the world's second largest barrier reef offers some of the finest diving in the world. And Belize's easygoing ways, a legacy of its past as a British colony, feels far more akin to a small Caribbean island than a Central American republic. Note: Belize City is an anchorage port, guests transfer to shore via local tender. Belize was once home to the ancient Mayas. One of the earliest known Mayan cities dates to 2000 B.C., and at the height of the Mayan Empire, their population rose to as many as two million. Take a motorboat ride on the Old Belize River through the jungle. As you cruise the waterways teeming with crocodiles and iguana sunning on rocks, listen for the cries of howler monkeys and birds. Glide through the water beneath awe-inspiring stalactites and past dramatic cave formations as your trusty inner tube takes you through the sacred underworld of the ancient Mayans. Paths carved into 29 acres of jungle allow visitors to see more than 125 animals native to Belize, including jaguars, ocelots, peccaries, storks, howler monkeys, tapirs, crocodiles and more. This famed nature park features horseback riding and over 200 species of flora, as well as a diverse population of wildlife. Keep your eyes open wide and peer down at ancient caves as you soar across an exhilarating jungle zipline through the lush rainforest canopy of Belize. Discover four amazing cayes (pronounced keys) which can be reached by boat from Belize City. Belize's Barrier Reef and its three atolls all feature superb wall dives and snorkeling. Skim across the marshy waters of Almond Hill Lagoon, where you may be lucky enough to spot a manatee before admiring the mangroves, water lilies and crocodiles of Indian Creek.